Over the past decade digital cameras have come a long way in the quality arena. These days even your phone camera will boast more megapixels than the original digital cameras, but for all the millions of megapixels that the manufacturers can cram into the sensor now, if you’re not using a good quality setting then their efforts have been somewhat in vain. Picture quality is one of those universal settings whether you’re in auto/pre-set mode or in the semi-manual/manual modes when you’re taking photos as JPEGs. If you go into the picture quality menu on your camera you will generally see JPEG options of Small/Basic, Medium/Normal, Large/Fine (or words to that effect, have a look in your manual for your exact camera options). Some are further divided so Canons show a graphic of a smooth curve or a set of steps, and a Nikon has a set of options Small, Medium and Large. What does all this mean though? Well, the quality of an image is all to do with the compression that is used. JPEGS use what is known as lossy compression, which means that any information that the camera decides that you don’t need is discarded. The lower the quality you choose, the more information is lost – it has been suggested that the compression ratios are along the lines of: Large/Fine 1:4, Medium/Normal 1:8 and Small/Basic 1:16. 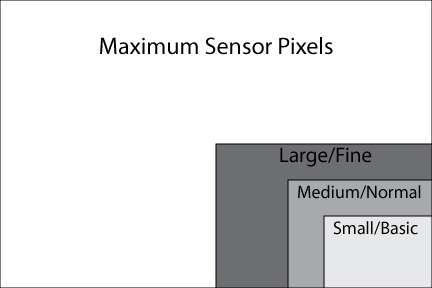 The diagram below demonstrates how many of the pixels are actually retained at each quality level. For the subdivisions, there are two approaches, with the Canon curve versus step options, this distinguishes between using a particular kind of separation between pixels – the steps option gives a blunter gradation between tones, while the curve blends more gradually. In Nikons, the Small, Medium and Large refers to how much of the screen is used for the picture, so the small uses a small part in the centre, and the large covers the entire screen. Now you’re probably scratching your head here going, well my camera has a 16mb sensor, why am I losing 12 mb even at top quality, what’s the point? Well there’s actually another set of options that you may have noticed, which covers RAW. RAW files are effectively digital negatives, like you used to get in the old days with film, and contain almost every bit of information you can get from the sensor. They are named because, like a film negative, they are in a raw state, so a RAW file can’t be printed out directly it must be processed through software first. Because of the way that picture processing is carried out for the auto and preset modes, RAW is not available in these modes. We will look more closely at RAW files later on in the series. Many people choose the lowest common denominator in the quality settings when they buy a camera because that lets them get the most images on a card (and you know those cards are expensive when you buy them in the camera shop) but this is effectively negating all those manufacturers’ efforts to get more pixels in because you’re getting rid of most of them! It’s kind of like buying a Ferrari that you’ll only drive in second gear because you’ve heard that that uses the least amount of fuel, and then complaining that the car won’t go fast. Incidentally I have actually stood in a camera shop while someone ranted and raved at the shop assistant because their camera “wasn’t taking good photos” when they tried to blow them up to bigger than 6”x4”, and they had paid all that money for those megapixels which were obviously useless. The customer eventually admitted that they had gone with the lowest quality file option because that’s how you got the most photos on the card, which meant that he’d effectively discarded the information that would allow for good quality photos at a larger size. So what should you go for? Well I would say go for the best quality option to avoid disappointment both in case you take a notion to blow up the photo to a bigger size, and also in case you want to manipulate the file in any way, such as to Photoshop out some rubbish from the background of a photo – every time you manipulate a JPEG it loses more information when saved, so always make sure you have a copy of the original before editing, and try and do all your editing in one go to avoid losing too much information. As a tip for you, shop around online for memory cards for your camera – for example in store on the high street a 16mb Sandisk Extreme Pro Compact Flash card may cost you £75, but online from a memory discount store it will set you back £49. If you’re not worried about the write speed (and that is really only an issue if you intend to do video or a lot of rapid fire shots), then an 8mb one will cost you all of £9.99. UK shops that are good for this are mymemory.co.uk, 7dayshop.com and dabs.com. Now that we’ve looked at quality, the next other thing to be looked at today is stability. Keeping your camera stable in other ways than you hand holding it can be useful for many things, for example it means you can use slow shutter speeds without introducing camera shake. 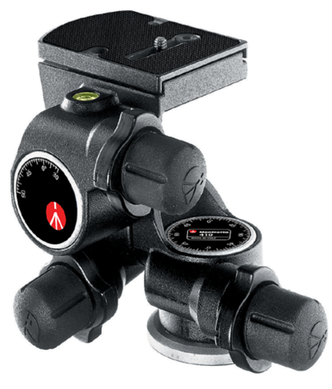 It can also mean that you can set the camera up to take a photo of you, or set it up at an angle that you can’t, or don’t want to, get comfortably to for any length of time. 1. Use a table or counter surface to set your camera down on. In this case put the camera so that the end of the lens is at least level with the edge of your surface if not hanging over a bit. This will ensure that you don’t end up filling up half the photo with table! This option is fine if you’re staying in the one place, but is obviously not a portable option, and is somewhat limited in height. 2. Use a tripod to mount your camera on. 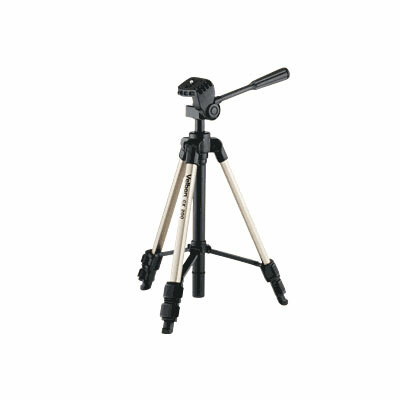 Tripods can come in all shapes and sizes from ones that are the same height as you right down to mini table top ones and ones with bendy legs that will wrap around trees and lampposts (amongst other things). The key thing when choosing a tripod is to look at the maximum weight it will support, as this needs to be at least equal to the weight of your camera + the heaviest lens you want to use with it. Choosing one that is too light may result in the whole thing toppling over, which will likely be the end of your camera (although there are full sized tripods that come with hanging hooks underneath for you to hang your bag on and try and weight the legs down). Whereas with the new one, with Manfrotto 055 XPROB legs and Manfrotto 410 junior geared head, the legs are independent, and the central column will turn through 90 degrees, so I can get it practically flat on the ground, which is useful if you happen to like crawling around forest floors looking for mushrooms. I can also have the legs at different angles, which is great for the sides of hills or in waterfalls. 3. Use a beanbag to place your camera on. Beanbags can be very useful on rough ground or places where you don’t have enough space to spread the legs out on a tripod, say in a vehicle or on top of a dry stone wall. They can mould themselves around both your camera and the surface they’re lying on, which gives you a stable platform to work from. Like the table top option, beanbags have obvious height limitations, unless you can find something at the appropriate height to place them on. The good news is that they’re pretty cheap and easy to make, especially for sewers! I’ll have a tutorial up on how to make one soon. 4. Use a monopod to mount your camera on. As the name suggests, these have just one leg, and often double up as a walking pole. Monopods are particularly useful when you need to both stabilise and move your camera, such as following action shots. They work by providing both support and a pivot point in these cases, so for example if you were following motor racing, you could focus on the subject and follow it round a bend, taking shots along the way. My monopod is by far the least used piece of kit I own, but since I bought mine at a deep discount online for about £10 I’m not hugely upset about that. Hopefully these will give you something to think about, but if you have any questions, please let me know. I'd be thrilled if I was asking questions like that about sensors as it would mean that I actually had some idea of what you are talking about! I just have a Canon Elph cause I like to be able to put it in my pocket. I go middle of the road on the size so I can get loads of shots but the files aren't so small…big enough if I want to do an 11X14 which I hardly ever would! 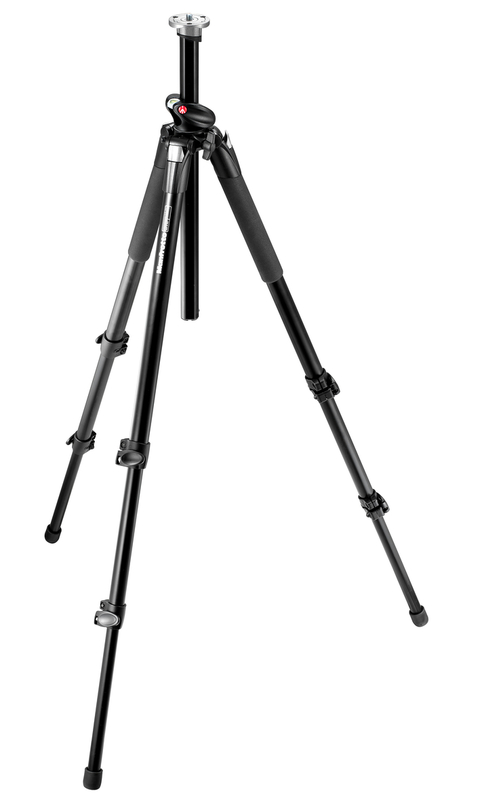 I confess I had a tripod – same brand and very similar to your new one I hardly use! I forget I have it and I was given a remote that needs a new battery that I never got around to getting so that doesn't help! Also those cards you refer to are they the larger physical size cards because I've never seen any so expensive as that. 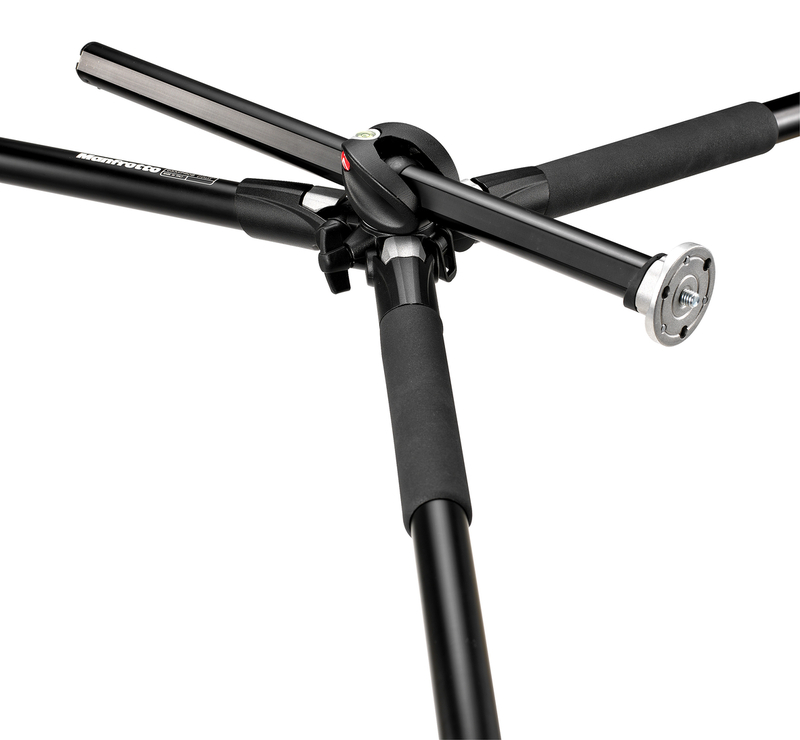 I have a Manfrotto, and there's only one thing wrong with it: it's heavy. Whenever I need it, I don't have it with me! Of course, it's weight makes it stable which is an advantage, but I tend only to use it when I'm at home. I'm kinda in the same boat as Celtic Thistle above…I don't understand very clearly. I am doing poorly at keeping up with your challenges, sad to say, but did the 2nd one recently and need to check out my photos! Good idea about the beanbag. We do have a couple of different style tripods, but I can see where that beanbag would be really helpful in some cases! Thanks for this series — very interesting. On the first issue – I always knew that it was better to save bigger files because they made better enlargements, but I didn't know exactly WHY. That totally makes sense, thanks!